Exiles’ hopes of reaching the ‘final four’ were dashed last night when they were beaten by Sirens for the second time in two days by a slender goal for the Northerners to book the last berth together with San Giljan, Sliema and Neptunes who beat Valletta United 14-7 in a curtain raiser. It was a nail biting contest between two teams of the same level. Exiles forged ahead with a lucky goal but Sirens retaliated to nose ahead (2-1) before Cousin equalized (2-2) after earlier Nikic missed a penalty for Exiles. The second session was all Sirens when a hat-trick by Bicari and a Mark Fenech goal for Exiles opened a three-goal-lead (6-3) before Nikic reduced the gap with a flick to narrow the gap to two goals. In the dying seconds of the quarter, the Exiles rearguard was caught napping with a backhand by Brownrigg of Sirens to start the second part of the match trailing by three goals. The third session saw a tremendous rally by Marco Cuk’s boys to shake their opponents’ confidence to win the quarter (4-1) and start the fourth and final session level (8-8). There were the usual controversial decisions that could have given a twist to the match but the officials on the catwalk interpreted otherwise. The fourth and final session was characterized by incessant swimming with Exiles having their chances to forge ahead but had to face Grixti’s form between the Sirens’ goalposts. With four minutes to the end, Sirens took the lead and kept it until the final horn. Exiles threw all they had to at least save the match but a man-up situation in the dying seconds was not converted and Sirens won their second match and the qualification with an overall two-goal difference. Exiles suffered five exclusions with one of them followed by a penalty for interfering. Sirens managed to convert one of their man superiority but another penalty awarded by also scored. In their man-ups, Exiles failed to score in five of their six chances, apart from an other exclusion that was followed by a penalty for interfering and was converted. A penalty in the first session was missed with the score standing 2-1 in favour of Sirens. Marco Cuk made use of all players in the squad except reserve goalkeeper Gianni Ciappara: Matthew Castillo, Mark Fenech (2 goals), Andrea Bianchi, Michele Stellini, Timmy Sullivan (1 goal), Sean Xerri de Caro (1 goal), Slobodan Nikic (2 goals), Kurt Griscti, Nicky Paris, Aurelien Cousin (2 goals), Benji Lanzon and Philip Paris. Yesterday’s encounter was the last competitive match in the team’s progamme. 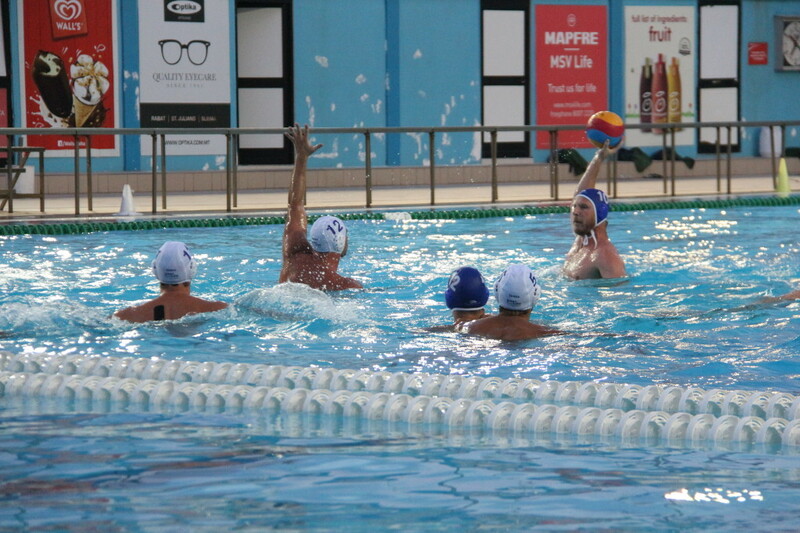 Notwithstanding, yesterday’s disappointment, this season will definitely be remembered not only by Exiles supporters but also the followers in the local sphere of waterpolo of the prestigious wins by the Exiles team lead by Marco Cuk in his first ever experience at coaching. photo by Saviour Brincat shows Aurelien Cousin (blue cap) attempting at shot at goal during the first half of yesterday’s clash.